Have you ever had to pay a fee to get your own money from an ATM? If so, you’re not alone. Nor are you in the minority if your bank has ever socked you with an unexpected overdraft fee. In fact, according to CNNMoney, in 2016, America’s three biggest banks alone raked in more than $6.4 billion dollars in these fees from their customers. Despite public outcry, there’s little anyone can do about it, either—except take their business to a more caring financial institution like Alliant Credit Union. RewardExpert recently spoke to Dana Vas Nunes, senior manager of deposit products at Alliant, about the many ways in which the institution differs from big banks and even other credit unions. “Our mission is really to help our members improve their financial position in life,” Vas Nunes explained. Not only does the credit union forgo monthly maintenance fees on deposit accounts, but its insufficient funds fee is much lower than most banks or other credit unions. Additionally, Alliant Credit Union offers its members the best interest rates possible whether they are saving or borrowing. This is possible, in part, because Alliant keeps its expenses low by operating primarily as a digital financial institution. The lack of physical branches (except for those that still serve United Airlines employees, Alliant’s original members, behind TSA airport security lines) doesn’t make banking with the credit union any less convenient for members, however. Should a member with a checking account choose an ATM that requires a fee, Alliant Credit Union will reimburse them up to $20 a month. Alliant members can also conduct transactions online at the credit union’s website or using the award-winning mobile app. 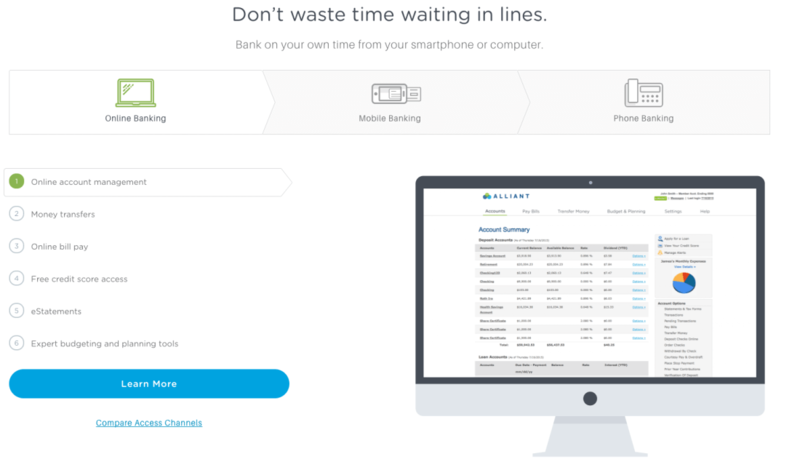 The variety of products and services Alliant Credit Union provides is as good—or better—than consumers will find at any other physical or digital financial institution. “Unlike other online banks, we look at ourselves as a full-service financial institution,” Vas Nunes explained. In addition to free high-rate checking and savings accounts, Alliant offers its members saving accounts for kids, checking accounts for teens, and supplemental savings accounts. Alliant also offers a variety of loans —from student and vehicle loans to mortgages, personal, and business loans—as well as retirement products, credit cards, and insurance. If you’d like to learn more about joining one of the largest credit unions in the U.S. with more than 335,000 members nationwide and over $9.3 billion in assets, visit www.alliantcreditunion.org.